***Low-risk roulette bets, red/black, odd/even, and low/high, do not count towards Loyalty Points. All double options on Slots & Video Poker (all varieties) will not earn loyalty points. 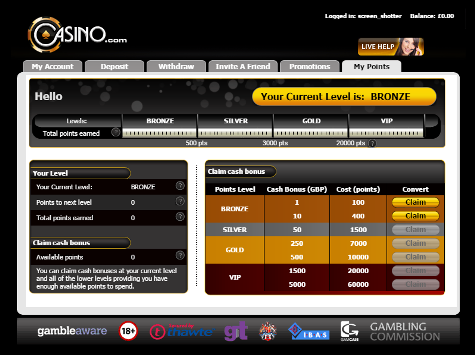 Casino.com reserves the right to revoke loyalty points in cases where players are using different systems or strategies to abuse this loyalty scheme. At Casino.com, we appreciate our loyal players. That’s why your loyalty level is based on how many points you have earned since joining our casino. Even if it takes you a little longer to increase your loyalty level, we’ll wait for as long as it takes and reward you all the way. To qualify as a VIP at Casino.com you need to have accumulated 20,000 points and have deposited $3,000. You can claim cash bonuses relating to your loyalty level, the higher you climb through the levels, the higher the bonus you are eligible to claim. There are seven available bonuses depending on your loyalty level. By saving your points and spending at the higher levels, you will get more cash for your points, as shown in the table below. You are on silver level and you have 1,000 points. This means that you have enough points to claim only the $10 bonus twice, leaving 200 points in your balance. However, if you save your 1,000 points and earn an extra 500, you can claim a $50 bonus and have a much better redemption rate by getting an extra 33%. But it pays to save. If you keep playing and save your points up to 7,000, you will become a Gold member (at 3,000 points) and be able to claim the $250 cash bonus with an even better redemption rate. This will give you an extra 43% for your points! Remember, the more points you spend in one go, the better exchange rate you get! A maximum of $5,000 (Bronze, Silver and Gold), $20,000 (VIP) and $30,000 (VIP Elite) in cash bonuses from loyalty points can be redeemed per calendar month. To spend your points or to see how many you have earned so far you will need to go to the cashier in the casino software and click on the ‘My Points’ tab (shown below). If you have enough points to redeem any of the bonuses, you will be able to click on the ‘Claim’ button, which will put the bonus into your account instantly.